So many distinctive actors have already played Sherlock Holmes, including the likes of Basil Rathbone, Peter Cushing, Christopher Lee, and Robert Downing, Jr., mystery fans are predisposed to give each new taker a fair crack at the role. Benedict Cumberbatch has an advantage not available to most prospective Holmeses, recreating the role in a modern context. Indeed, he brings the Holmes attitude in spades for the BBC’s Twenty-First Century reboot Sherlock (trailer here), which debuts for American audiences this Sunday on PBS’s Masterpiece Mystery. Recently returned from his tour of duty in Afghanistan, Dr. John Watson is at loose ends. In need of a job and flat, he accepts a share with a rather eccentric gent with a high opinion of himself. You already know the name and the address. Holmes is still a consulting detective who delights in showing up the long-suffering Detective Inspector Lestrade. However, in today’s London, Holmes’ notoriety spreads via his website rather than the Strand magazine. The three episode run begins with this Sunday the getting-to-know-you mystery of A Study in Pink. A rash of seemingly unconnected suicides is sweeping London, leaving the police baffled, not even convinced there is a crime to investigate. Of course, Holmes knows better, as he makes clear to the coppers in embarrassing public forums. Supposedly recovering from post-traumatic stress, Dr. Watson is only too willing to jump into the fray with his high-handed roommate, despite the efforts of a shadowy government official to warn him off. Frankly, the mystery of Pink is weakest of the series, borrowing elements from an old Law & Order episode. However, it sets up the meta-storyline quite effectively, including a tantalizing hint of a malevolent criminal mastermind lurking on the fringes of the action. Indeed, one of the strengths of Sherlock is the manner in which it integrates the Moriarty mythos into the narrative. Probably Sherlock’s most intriguing case comes in The Blind Banker, combining a modern twist on the locked room mystery with old school ciphers, and the Victorian preoccupation with triads and tongs. Guest star Gemma Chan also makes a strong impression as Soo Lin Yao, an expert in Asian antiquities who most likely holds the key to the mystery, but has gone into hiding for understandable reasons. In the concluding The Great Game Cumberbatch and Martin Freeman really hit their stride as Holmes and Watson. Their friendship starts to deepen organically, while the stakes increase as Holmes ’ shadowy nemesis finally starts to show his hand. There is not much time to chew on the intrigue though as the two race around London solving a diverse series of crimes—a speed sleuthing challenge, if you will. 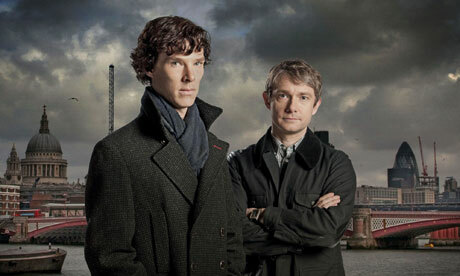 Picking up considerable momentum as it goes along, Sherlock leaves viewers knowing there will be more to come. Overall, it is a well crafted mystery series, with feature director Patrick McGuigan (Lucky Number Slevin) slickly helming Pink and Game. Cumberbatch is convincingly arrogant in an appropriately entertaining way, while Freeman projects the right salt of the earth decency as Watson, without coming across as a Nigel Bruce bumbler. By and large, the modernization is also smartly realized, making Holmes a creature of texting and the internet just barely on the right side of creepy. 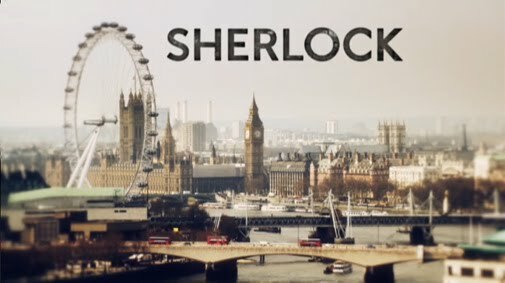 However, it just does not sound right to hear him say the “game is on.” Highly entertaining, Sherlock premieres on Masterpiece Mystery this coming Sunday (10/24), continuing on the next two successive Sundays on most PBS outlets nationwide.